The incidence of kidney failure treatment in the United States increased 57% from 1991 to 2000. Chronic kidney disease (CKD) prevalence was 11% among U.S. adults surveyed in 1988 to 1994. The objective of this study was to estimate awareness of CKD in the U.S. population during 1999 to 2000 and to determine whether the prevalence of CKD in the United States increased compared with 1988 to 1994. Analysis was conducted of nationally representative samples of noninstitutionalized adults, aged 20 yr and older, in two National Health and Nutrition Examination Surveys conducted in 1988 to 1994 (n = 15,488) and 1999 to 2000 (n = 4101) for prevalence ± SE. Awareness of CKD is self-reported. Kidney function (GFR), kidney damage (microalbuminuria or greater), and stages of CKD (GFR and albuminuria) were estimated from calibrated serum creatinine, spot urine albumin to creatinine ratio (ACR), age, gender, and race. GFR was estimated using the simplified Modification of Diet in Renal Disease Study equation. Self-reported awareness of weak or failing kidneys in 1999 to 2000 was strongly associated with decreased kidney function and albuminuria but was low even in the presence of both conditions. Only 24.3 ± 6.4% of patients at GFR 15 to 59 ml/min per 1.73 m2 and albuminuria were aware of CKD compared with 1.1 ± 0.3% at GFR of 90 ml/min per 1.73 m2 or greater and no microalbuminuria. At moderately decreased kidney function (GFR 30 to 59 ml/min per 1.73 m2), awareness was much lower among women than men (2.9 ± 1.6 versus 17.9 ± 5.9%; P = 0.008). The prevalence of moderately or severely decreased kidney function (GFR 15 to 59 ml/min per 1.73 m2) remained stable over the past decade (4.4 ± 0.3% in 1988 to 1994 and 3.8 ± 0.4% in 1999 to 2000; P = 0.23). At the same time, the prevalence of albuminuria (ACR ≥ 30 mg/g) in single spot urine increased from 8.2 ± 0.4% to 10.1 ± 0.7% (P = 0.01). Overall CKD prevalence was similar in both surveys (9% using ACR > 30 mg/g for persistent microalbuminuria; 11% in 1988 to 1994 and 12% in 1999 to 2000 using gender-specific ACR cutoffs). Despite a high prevalence, CKD awareness in the U.S. population is low. In contrast to the dramatic increase in treated kidney failure, overall CKD prevalence in the U.S. population has been relatively stable. By 2010, estimates project that 650,000 individuals will require treatment for chronic kidney failure (1,2), a 60% increase from the 406,000 who received such treatment in 2001 (2). From 1991 to 2000, the prevalence of ESRD treatment grew by 97% and the incidence increased by 57%. The increase in ESRD incidence could have resulted from increases in the pool of patients with chronic kidney disease (CKD), increases in the rate of their disease progression, decreases in competing mortality, and/or increasing treatment availability. This article quantifies the pool of CKD patients in 1999 to 2000 and compares it with that in 1988 to 1994. In addition, the level of awareness of “weak or failing kidneys” is documented by the presence or absence of markers of CKD (kidney function and albuminuria). Estimates based on the Third National Health and Nutrition Examination Survey (NHANES III; conducted from 1988 to 1994) suggest that 11% of U.S. adults had CKD and 4% of adults had decreased kidney function (3–5). In Medicare billing data (2), CKD was diagnosed in 1.2 million older adults in 2002, substantially fewer than the 7 million adults over the age of 65 with decreased kidney function and CKD based on NHANES III (4). CKD is associated with a two- to threefold higher risk of death, in addition to a higher risk of requiring dialysis and developing congestive heart failure or other cardiovascular event (6). Despite this higher risk, preventative care including lipid monitoring and glycemic monitoring among individuals with diabetes was no higher among Medicare patients with CKD than in patients without CKD (2,6). Chart review of patient populations also suggests that CKD is often undiagnosed, and complications of later stages of CKD are often untreated (7–9). It is also unknown how often adults with CKD are aware that they have kidney disease even though patient and physician education is a major goal of the National Kidney Disease Education Program (www.nkdep.nih.gov). The NHANES, conducted by the National Center for Health Statistics, provide representative samples of civilian noninstitutionalized U.S. residents for examining disease prevalence and trends over time. Standardized interviews were conducted in the participant’s home, followed by a detailed physical examination, blood collection, and urine collection at a mobile examination center (MEC). Participants gave informed consent, and procedures were approved by an institutional review board. This analysis examines data from NHANES 1999 to 2000 and NHANES III, 1988 to 1994, whose procedures have been described in detail (10–13). BP was measured during the home interview and in the MEC in NHANES III and in the MEC only in NHANES 1999 to 2000. The arithmetic averages of all available diastolic and systolic measurements were used. A random spot urine sample was obtained from MEC-examined participants, using a clean-catch technique and sterile containers, and frozen nonhematuric specimens were analyzed (10,14). Urine albumin and creatinine concentrations were measured in the same laboratory during both surveys: albumin was measured by solid-phase fluorescence immunoassay, and urine creatinine was measured by the modified kinetic method of Jaffe using a Beckman Coulter Synchron AS/Astra Analyzer. Serum creatinine was measured by the modified kinetic method of Jaffe using a Roche Hitachi 737 analyzer in the 1988 to 1994 survey and using a Hitachi 917 analyzer in the 1999 to 2000 survey (10,15). The CKD stages are those provided by the Kidney Disease Outcomes Quality Initiative (3). Participant demographics are based on self-reported age and race/ethnicity elicited during the NHANES interviews. Those who responded “yes” to the question, “Have you ever been told by a doctor or other health professional that you had weak or failing kidneys (excluding kidney stones, bladder infections, or incontinence)?” were defined as aware of kidney disease. Participants who responded “yes” to the question, “Have you ever been told by a doctor or other health professional that you had diabetes or sugar diabetes?” were defined as having diabetes. Hypertension was defined as present when either one of two criteria applied: (1) the participant self-reported a previous doctor diagnosis of hypertension and was currently taking prescription medication for the condition, or (2) the participant had average systolic pressure ≥ 140 mmHg or average diastolic pressure ≥ 90 mmHg. Urinary albumin-to-creatinine ratio (ACR) was computed and is reported in milligrams per gram. Microalbuminuria is defined as an ACR of 30 to < 300 mg/g. Participants with ACR ≥ 300 mg/g were defined as having macroalbuminuria. These definitions are consistent with consensus endorsements for determining abnormal levels of albumin excretion in random spot urine collections (16,17). Gender-specific ranges for microalbuminuria and macroalbuminuria that account for higher creatinine excretion in men than women were also used in calculating the prevalence of CKD stages 1 and 2 (3,4,18). Kidney function was assessed by estimating GFR with the simplified Modification of Diet in Renal Disease Study (MDRD) prediction equation (3). Specifically, estimated GFR = 186.3 × (serum creatinine in mg/dl)−1.154 × age−0.203 × (0.742 if female) × (1.21 if black). Before use in the formula, the value of 0.13 was added to the reported serum creatinine concentration for NHANES 1999 to 2000 participants and the value of 0.23 was subtracted from the reported serum creatinine concentration for NHANES 1988 to 1994 participants. These serum creatinine adjustments align the NHANES measures with the creatinine assays used in the development of the MDRD equation (19). Estimated GFR is reported in ml/min per 1.73 m2. Values that exceeded 200 ml/min per 1.73 m2 were truncated at that level, and individuals with values <60 ml/min per 1.73 m2 are characterized as having decreased kidney function. This study is limited to MEC-examined participants who were aged 20 yr and older and had measures of estimated GFR ≥ 15 ml/min per 1.73 m2 (n = 15,488 in NHANES III and n = 4101 in NHANES 1999 to 2000). Adults with insufficient data to estimate GFR (6% in 1988 to 1994 and 7% in 1999 to 2000) were excluded. Strata for the presentation of statistics include gender (male or female), age group (20 to 39, 40 to 59, 60 to 69, or 70+ years), race/ethnicity (non-Hispanic white, non-Hispanic black, Mexican American, or other), diagnosed diabetes (yes or no), and hypertension status (on medication, not taking medication but with high BP, or no evidence of hypertension). Estimated kidney function was classified into four categories (GFR 15 to 29, 30 to 59, 60 to 89, and 90+ ml/min per 1.73 m2), and prevalence statistics for each GFR level were computed for the overall population, as well as for each strata variable. Severely and moderately decreased kidney functions are often combined to provide a single, more precise estimate of decreased kidney function (GFR 15 to 59 ml/min per 1.73 m2). Similarly, the prevalence of ACR levels (< 30, 30 to 299, ≥ 300 mg/g) in the overall population and for all strata variables were computed, excluding people with missing ACR data and women who were pregnant or in menses. Inferences were based on comparisons of 95% confidence interval (CI) estimates, and P < 0.05 was considered statistically significant. All prevalence estimates and percentiles of the distribution of GFR by age were computed using sampling weights provided by National Center for Health Statistics, and SE were computed in accordance with recommended procedures for NHANES 1999 to 2000 including the delete 1 jackknife method (11,20). The weights account for differential nonresponse and probability of selection. Thus, the results apply to the civilian noninstitutionalized U.S. population. NHANES 1988 to 1994 estimates best represent the survey midpoint, October 1991. Analyses were performed using SUDAAN software (RTI, Research Triangle Park, NC) for the analysis of complex survey data. Population estimates of the percentage affected by CKD were computed separately for each of four stages of CKD, defined in accordance with the National Kidney Foundation classification system (3) and summed. The algorithms for calculating percentages (PCT) in each group were: PCT(stage 4) = PCT(GFR 15 to 29); PCT(stage 3) = PCT(GFR 30 to 59): PCT(stage 2) = PCT(ACR ≥ 300 | GFR 60 to 89) × PCT(GFR 60 to 89) + (0.75) × PCT(ACR 30 to 299 | GFR 60 to 89) × PCT(GFR 60 to 89); PCT(stage 1) = PCT(ACR ≥ 300 | GFR 90+) × PCT(GFR90+) + (0.509) × PCT(ACR 30 to 299 | GFR 90+) × PCT(GFR90+). The multiplying constants, 0.75 and 0.509, represent assumed levels of persistent microalbuminuria (30 to 299 mg/g) and were derived from repeat measures in a subset of NHANES 1988 to 1994 participants using similar methods to previous national estimates (4,10). CI for CKD prevalence estimates and ratios that combine the sampling variation of each number in the calculation, including the albuminuria persistence rates, were calculated using bootstrapping methods implemented in Stata (Stata Corp., College Station, TX). Overall, 2.0% (95% CI 1.4 to 2.6) of the population of adults 20 yr of age or older in 1999 to 2000 self-reported a history of weak or failing kidneys. Awareness was higher at lower kidney function and higher albuminuria, supporting the validity of the awareness question (Figure 1). Fewer than one fifth (18.6 ± 6.3%) of adults with both moderately decreased kidney function (30 to 59 ml/min per 1.73 m2) and albuminuria (>30 mg/g) reported previous knowledge/diagnosis of weak or failing kidneys; awareness increased only to 24.3 ± 6.4% for individuals with a GFR of 15 to 59 ml/min per 1.73 m2 and albuminuria (only nine survey participants with awareness data had GFR of 15 to 30 ml/min per 1.73 m2, and all had ACR >30 mg/g). Awareness for all individuals with moderately decreased kidney function was less than one tenth (8.2 ± 2.3% for GFR 30 to 59 ml/min per 1.73 m2, CKD stage 3). In this group, awareness levels were significantly lower in women compared with similarly affected men (2.9 ± 1.6 versus 17.9 ± 5.9%, respectively; P = 0.008). Women with moderately decreased kidney function had lower mean serum creatinine than men in the same category (1.2 versus 1.6 mg/dl; P < 0.001). Proportion of individuals who were ever told that they had weak or failing kidneys by the level of GFR (ml/min per 1.73 m2), elevated urinary albumin to creatinine ratio (ACR; mg/g) and gender. P = 0.008 for comparison of men and women with GFR of 30 to 59. Error bars indicate 95% confidence intervals showing that the upper limit of all confidence intervals is <32%, but only the estimate of 1.1% in GFR 90+ and ARC <30 meets the standards for statistical reliability (relative SE <30%) . Similar age-related declines in kidney function were observed in both time periods (Figure 2). Median estimated GFR (ml/min per 1.73 m2) declined between age 20 and 29 yr and age 70+ yr from 107 (95% CI 106 to 108) to 72 (95% CI 71 to 73) in 1999 to 2000 and from 113 (95% CI 112 to 114) to 75 (95% CI 73 to 77) in 1988 to 1994. The prevalence of different levels of kidney function among U.S. adults during 1988 to 1994 and 1999 to 2000 is shown in Table 1. The overall prevalence of mildly decreased kidney function (GFR 60 to 89 ml/min per 1.73 m2), which alone does not define CKD, significantly increased from 31.2% (95% CI 29.7 to 32.7) in 1988 to 1994 to 36.3% (95% CI 33.8 to 38.8) in 1999 to 2000. Remarkably, the prevalence of decreased kidney function (GFR 15 to 59 ml/min per 1.73 m2) did not change between the two time periods (4.4% [95% CI 3.9 to 4.9] and 3.8% [95% CI 3.1 to 4.6], respectively). Similar patterns were observed across gender, age, and race/ethnicity groups. Percentiles of estimated GFR by age. National Health and Nutrition Examination Survey (NHANES) 1999 to 2000 (squares) and NHANES III 1988 to 1994 (circles). In both surveys (Table 1), the prevalence of decreased kidney function (GFR 15 to 59 ml/min per 1.73 m2) was higher in women than in men (4.8 ± 0.6 versus 2.8 ± 0.4% in 1999 to 2000). Non-Hispanic whites were more likely to have decreased kidney function in both time periods (5.0 and 4.2%, 1988 to 1994 and 1999 to 2000, respectively) than non-Hispanic blacks (3.1 and 3.5%, 1988 to 1994 and 1999 to 2000, respectively) and Mexican Americans (1.1 and 1.2%, 1988 to 1994 and 1999 to 2000, respectively), although the 1999 to 2000 difference between Non-Hispanic white and black prevalence rates was not significant. Both hypertension and a history of diabetes were associated with a high prevalence of decreased kidney function and albuminuria (Figure 3). In the absence of these conditions, decreased kidney function and albuminuria were uncommon in the population as a whole (1.4 and 6%, respectively, in 1999 to 2000). Age is an important factor, and even in the absence of hypertension and self-reported diabetes, 12% of adults aged 65 yr or older had decreased kidney function and 11% had albuminuria (1999 to 2000 data in Figure 3). 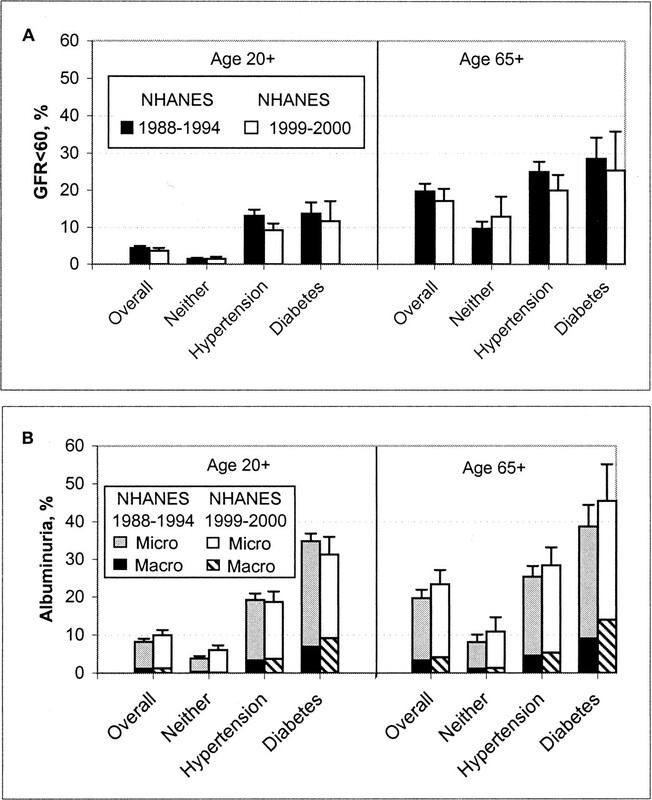 Prevalence of markers of chronic kidney disease by hypertension and history of diabetes in NHANES III (▪) and NHANES 1999 to 2000 (□) for adults over the age of 20 and 65 yr. (A) Decreased GFR (< 60 ml/min per 1.73 m2). (B) Albuminuria (micro at ACR 30 to 299 mg/g and macro at ≥ 300 mg/g). Error bars indicate the upper limit of the 95% confidence intervals. The prevalence estimates of decreased kidney function and albuminuria in the U.S. population as reflected in NHANES show the overall burden of CKD (Table 3). The prevalence of CKD (stages 1 to 4) was 8.8 ± 0.4% in 1988 to 1994 and 9.4 ± 0.7% in 1999 to 2000 when 30 and 300 mg/g ACR cutoffs are used to define microalbuminuria and macroalbuminuria, as suggested by a recent consensus conference (16,17). Using gender-specific ACR cutoffs, which take into account the higher creatinine production among men (18), the prevalences are 10.6 ± 0.5% in 1988 to 1994 and 11.7 ± 0.8% in 1999 to 2000. Additional data are required for a more precise estimate of whether these subtle differences reflect more than random variation. The data indicate a small but statistically significant increase (P = 0.01) in the prevalence of CKD stages 1 and 2 as a result of the higher prevalence of albuminuria in 1999 to 2000. In contrast, the prevalence of moderately and severely decreased kidney function (CKD stages 3 and 4) has not changed significantly, with the ratio of the prevalence in the 1988 to 1994 survey to that of 1999 to 2000 was 0.87 with a 95% CI of 0.7 to 1.1. By contrast, the U.S. Renal Data System’s 2003 Annual Report showed that the burden of ESRD increased during the same time period. The point prevalence count, incidence rate, and age-adjusted incidence for ESRD increased by 95, 57, and 49%, respectively, from 1991 to 2000 (2). Fewer than 10% of individuals with moderately decreased kidney function (CKD stage 3) reported ever being told that they had weak or failing kidneys. This provides a baseline level of knowledge in the general population for future comparisons and is consistent with data showing that CKD is underdiagnosed and undertreated in a range of clinical populations (7–9,21). Even in the presence of both moderately decreased kidney function and proteinuria, fewer than one fifth of individuals reported awareness of weak or failing kidneys. The higher proportion of positive reports at lower kidney function and albuminuria suggests that asking about weak or failing kidneys has validity. Among the 20 individuals who were excluded from the analysis with a GFR <15 ml/min per 1.73 m2, all but the individual with the lowest serum creatinine in the group (serum creatinine range 3.9 to 11.9 mg/dl) reported that they were aware of having weak or failing kidneys. This study cannot separate physician and patient aspects of CKD diagnosis, treatment, and awareness. However, Medicare data show that a CKD diagnosis was made in 1.2 million (approximately 3% of Medicare beneficiaries) in 2000 (2). 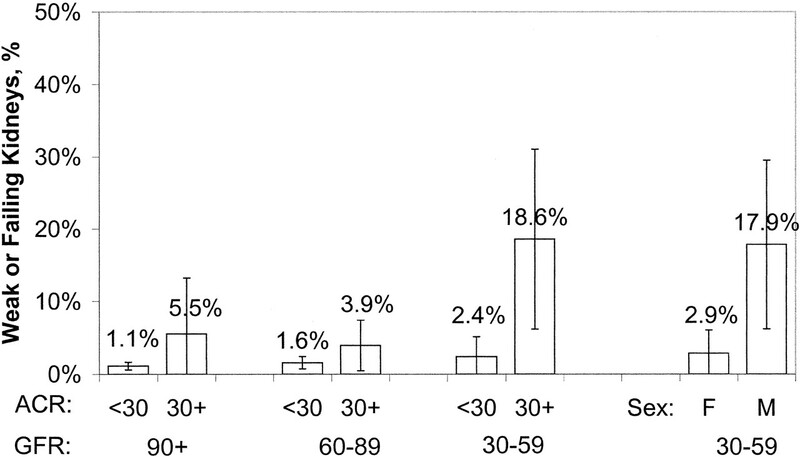 This rate contrasts with the approximately one fifth of adults over the age of 65 with stage 3 or 4 CKD (Figure 3) in NHANES 1999 to 2000 (18%, or 35 million), supporting the notion that much of CKD is underdiagnosed despite treatable complications (5). Although their analysis differs in some respects from ours, Nickolas et al. (22) also recently called attention to the relative lack of awareness of CKD. Although comparable proportions of men and women with albuminuria responded in the affirmative, women with decreased kidney function were less likely to report ever being told that they had weak or failing kidneys. This discrepancy likely reflects misinterpretation by providers of the lower mean and range of serum creatinine for women with stage 3 CKD than that for men (1.2 mg/dl, range 0.9 to 1.9 for women versus 1.6 mg/dl, range 1.1 to 2.5 for men). We suspect that health care providers are especially prone to overlooking CKD in older women, who often have a serum creatinine that is in the normal range for younger individuals. This finding highlights the importance of using GFR estimating equations that incorporate age and gender as variables. Future rounds of NHANES data will increase the sample size and allow for analyses of multiple factors (race, socioeconomic status, and health care utilization) associated with awareness of CKD not possible with only the NHANES 1999 to 2000 survey. The results of this study show a high but relatively stable prevalence of CKD among U.S. adults. During 1999 to 2000 (Table 3), an estimated 3.8% (95% CI 3.1 to 4.6%) of U.S. adults (approximately 7 million individuals) had CKD on the basis of decreased kidney function (GFR 15 to 59 ml/min per 1.73 m2, corresponding to CKD stages 3 and 4). An additional 5.6% of the U.S. population (11.3 million) had persistent albuminuria with a normal or only mildly decreased kidney function (GFR ≥ 60 ml/min per 1.73 m2), corresponding to CKD stages 1 and 2. These numbers far exceed the number of cases of treated ESRD (88,000 new cases and 436,000 treated cases in 1999 ), consistent with either nonprogression or a higher rate of mortality than progression to kidney failure in the majority of patients with CKD. Decreased kidney function was an independent risk factor of cardiovascular disease and all-cause mortality in several studies in the general population and among high-risk individuals (23). Medicare enrollees with a CKD diagnosis had a 5 to 10 times higher risk of death than ESRD (6). On the basis of these observations, the discrepancy between the size of the CKD pool and the incidence of ESRD may be derived in part from premature cardiovascular death in many people before progression to ESRD. It was surprising that overall estimates of CKD based on the 1988 to 1994 and 1999 to 2000 data are very similar. Although this near constancy provides some confidence that the estimates are generally reliable, the stability of the CKD pool is at odds with a >50% increase in ESRD incidence during that interval. These data suggest that the greater increase in the incidence of ESRD may reflect increasing treatment rates, a higher rate of progression of CKD to ESRD, and/or lesser rates of competing mortality, presumably as a result of less premature cardiovascular death. An independent analysis comparing changes in CKD prevalence in NHANES II (1976 to 1980) and NHANES III (1988 to 1994) to ESRD trends has recently noted the same discrepancy in the 1980s that we report for the 1990s with the rising incidence of ESRD far outpacing any increase in the CKD pool (25% increase in CKD stage 3 to 4 versus 2.6-fold increase in the number of incident ESRD cases) (24). Additional data on this issue are needed, particularly because progression of CKD to ESRD can take many years, suggesting that a longer period of observation than a decade would be useful. Estimates from a large sample of Medicare data suggest that CKD diagnosis among older individuals has doubled over the past decade from 0.6 to 1.2 million Medicare enrollees (2). Thus, trends in the prevalence of severe CKD, such as stage 4, and its diagnosis may differ from the trends shown here, which largely reflect the earlier and more common stages of CKD (stages 1 to 3). The observation of a greater prevalence of albuminuria in the general population and a possibly higher prevalence of macroalbuminuria among the growing number of adults with diabetes is consistent with more rapid progression as at least one contributor to ESRD growth. The growing prevalence of diabetes is estimated to explain 28% of the increase in ESRD from 1978 to 1991 (25). A reduction in competing mortality from stroke and myocardial infarction does explain a small portion (approximately 5%) of the expansion of ESRD between 1978 and 1991 (25). The degree to which these factors have contributed to the continued rise in ESRD since 1991 is uncertain. Other environmental and iatrogenic factors, such as radiologic contrast media, may also alter the balance between early CKD and ESRD (20). Whatever the reasons, the burden of CKD in the population, although persistently high, does not, on its own, explain the rise in the incidence of treated kidney failure. As expected, the prevalence of CKD was higher in hypertension, diabetes, and older age. Surprising, the prevalence of moderately and severely decreased kidney function is similar among blacks and non-Hispanic whites. This similarity is perplexing given the approximately fourfold increased risk of ESRD in the black compared with the white population (2). This seemingly paradoxical observation is consistent between the 1988 to 1994 and 1999 to 2000 surveys and remains after adjustment for age and gender (Table 1) as well as previous analyses of the 1988 to 1994 data (4,26). Several possibilities may explain the similar prevalences of CKD. Rates of progression to ESRD are faster in blacks, and they therefore would be expected to have more rapid movement through the CKD pool (27). The greater prevalence of macroalbuminuria in blacks (2.4 ± 0.61%) than in whites (1.0 ± 0.24%; P = 0.03) in 1999 to 2000 (Table 2) further supports more rapid progression. Furthermore, risk of myocardial infarction, at least among people with diabetes, is greater in whites (28). Hence, competing mortality from cardiovascular death may remove whites from the incident ESRD population. The MDRD equation does assign a higher GFR for blacks than for whites at any given level of serum creatinine. Although this empiric adjustment has been confirmed in a large sample of blacks beyond the original study population (29), any racial comparison of renal function on the basis of serum creatinine is sensitive to modeling correctly the quantitative difference in creatinine metabolism in blacks and whites. Finally, poorer care directed at attenuating or interdicting the progression of CKD might occur in blacks. Considerable data attest to such racial disparities, including later referral of black men with CKD to specialty consultation (30). Further research is needed to determine which hypotheses explain the higher risk of ESRD among minority populations. It is worth noting several limitations and strengths of the current study. First, estimating GFR from serum creatinine has well-recognized limitations, including substantial variation in creatinine production by age, gender, and race (31). To minimize the impact of these limitations, we used a newly developed equation with increased precision of estimating GFR and calibrated the serum creatinine measurements to the laboratory that generated the data for development of this equation (19). Although the number of blacks and individuals with a GFR > 60 was limited in the initial development of this formula, a recent large study has shown that the equation performs very well among hypertensive blacks (29). Still, the ability to estimate GFR accurately in the normal range (>90 ml/min per 1.73 m2) and in the general population is uncertain because it is an extrapolation of the MDRD study data. However, low GFR estimates from general population samples calculated using the MDRD study equation are associated with CKD complications and cardiovascular risk (3,23). The study of trends in CKD prevalence estimates from two NHANES surveys is less susceptible to bias because potential biases from each survey estimate outlined previously (3) are likely to operate similarly in two surveys. Several methodologic limitations apply to this use of NHANES data. Although the data are designed specifically to assess disease burden cross-sectionally in a national representative sample, they are limited in their ability to address disease risk and cause. Comparisons across surveys are subject to potential bias if unmeasured changes occur in data collection over time. The number of individuals with moderately decreased kidney function is not very large (n = 881 in NHANES III and 231 in NHANES 1999 to 2000) and the number with severely decreased kidney function (n = 45 in NHANES III and 10 in NHANES 1999 to 2000) is small, limiting the power of subgroup comparisons. For this reason, analyses focus on moderately reduced kidney function (GFR 30 to 59 ml/min per 1.73 m2) or reduced kidney function overall (GFR 15 to 59 ml/min per 1.73 m2) among individuals without kidney failure (GFR > 15 ml/min per 1.73 m2). Nationally representative studies are most powerful for comparing stages 1 to 3 CKD, for which the prevalence of each stage is > 3% and the prevalence among older individuals is > 10%. CKD estimates are adjusted to focus on persistent albuminuria, but repeat albuminuria data were available only on a subset of the participants in NHANES III, limiting the precision of the stages 1 and 2 CKD prevalence estimates. Changes in persistence of albuminuria would affect the prevalence estimates of CKD, although the confidence interval presented include the uncertainty in the persistence estimate. This analysis of CKD within the most recent NHANES 1999 to 2000 indicates three remarkable features. First, the awareness of CKD is low and a disparity exists such that women are far less apt to be aware of having decreased kidney function (GFR < 60 ml/min per 1.73 m2) than men. Second, although the burden of CKD is high, it has not increased substantially in nearly a decade since NHANES III, even though the incidence of ESRD has risen by >50% during that interval. Finally, whites and blacks share approximately the same prevalence of CKD overall despite the fourfold greater incidence of ESRD in blacks group. Given the high prevalence of CKD, efforts to increase awareness, diagnosis, and treatment are needed to meet the Healthy People 2010 goal of reducing new cases of CKD and its complications, disability, death, and economic costs (2). J.C. is partially supported by General Research Center Grants 5M01RR00722 and RR00035, American Heart Association Established Investigator Award, and National Institute of Diabetes and Digestive and Kidney Diseases (NIDDK) Grant 1R21DK67651. D.B.-H. is supported by a contract from the NIDDK (N01-DK-1-2478). The main results were presented at the American Society of Nephrology. Contrast-Induced Nephropathy and Long-Term Adverse Events: Cause and Effect? Reverse Race and Ethnic Disparities in Survival Increase with Severity of Chronic Kidney Disease: What Does This Mean? Renal Manifestations in the Metabolic Syndrome. Mortality Risk Stratification in Chronic Kidney Disease: One Size for All Ages?